From old real photo P.C. On verso it's post marked 14 Aug 1907 Paducah. addressed to Miss Ruth (something), McKinney, KY.
owned first by Burnside & Burnsville Packet Co.
owned last by Cumberland Transportation Co. Ran on upper Cumberland also on the Ohio River during low water seasons. Found this 4.40 X 6.80 inch image on ETSY listed by a dealer in LeClaire, Iowa. 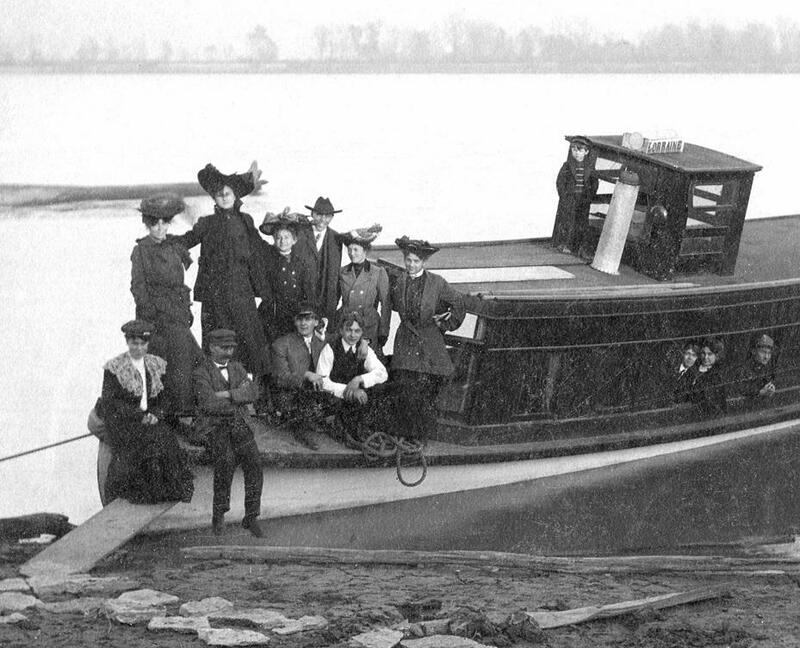 "Uncle Emil's boat (referring to the LORRAINE apparently) The Lothringers went to St. Louis Worlds Fair in 1904 (?)" Attached a detail of the passengers and pilot house in the front half of the boat and a file cropped in from the whole image that includes the overall length of the LORRAINE. An Emil Lothringer is listed online as having been born in Missouri in 1860. 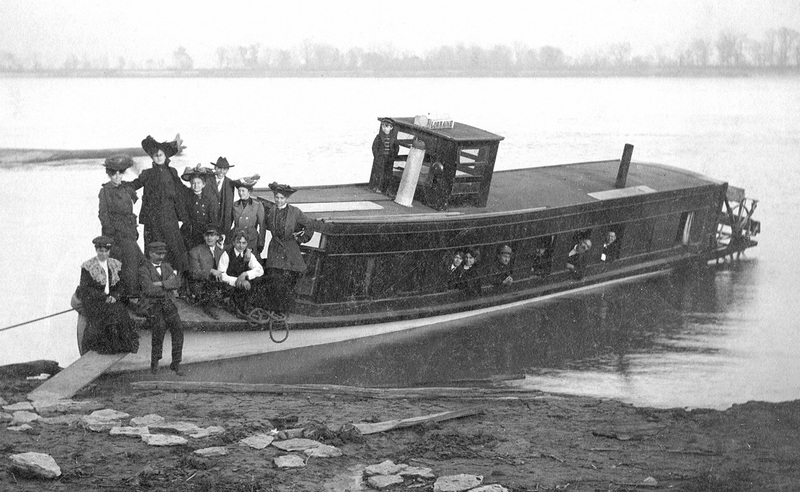 It is possible that Lothringer family members and guests traveled in the little LORRAINE from a town or city along the Mississippi or Missouri rivers to St. Louis in order to attend the 1904 Worlds Fair. Online there is a Lothringer listed as having come from Vienna, Austria and the name very likely prevalent in Germany and in German speaking Switzerland. Further genealogical research may reveal more about Emil and the Lothringers. COULD THIS BOAT HAVE HAD A STEAM ENGINE RUNNING IT? LOOKS KIND OF CROWDED IN THAT SMALL LOW CABIN AND IF THE BOAT SANK THEY'D BE LUCKY IF THEY COULD ESCAPE THROUGH ONE OF THOSE WINDOWS BEFORE THEY DROWNED. I DOUBT THIS BOAT WAS RUN BY STEAM, BUT MORE LIKELY BY A HIT AND MISS GASOLINE ENGINE. YOU CAN PROVABLY FIND A VIDEO OF ONE RUNNING ON YOU TUBE. THEY USED TO HAVE ANTIQUE ENGINE SHOWS HERE IN ALABAMA AND YOU WOULD SEE A LOT OF THEM THERE. THEY WERE USED ON FARMS TO POWER CORN GRINDERS AND OTHER THINGS. ALMOST ALL THE GAS BOATS HAD THIS TYPE OF ENGINE. THE SIZE RAN FROM SMALL TO LARGE. THIS BOAT SEEMS A LITTLE NARROW FOR THE MISSISSIPPI TO ME WITH THAT MANY PEOPLE ON IT. IT IS A RATHER ATTRACTIVE BOAT THOUGH. THANKS FOR THE PICTURE. The large pieces of abandoned wood in the foreground were likely wharf pilings which had been removed after they had gotten water logged and needed to be replaced with new lumber. Jim Hale was able to identify the boat in the snapshot. 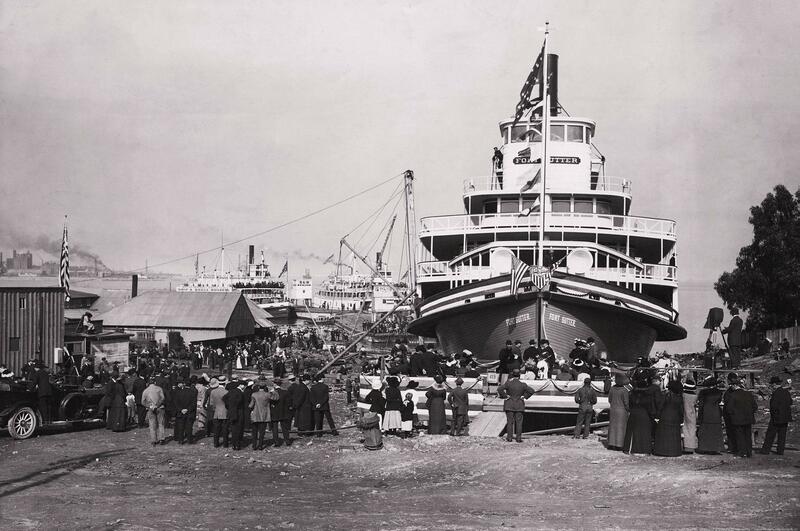 The TUTSHI's biography is on steamboats.org. S. S. TUSTSHI was launched in June 1917 by the British Yukon Navigation Company.The boat was 167 ft. long and held 110 passengers. Over the time more staterooms had been added on the texas deck to accomodate more passengers. 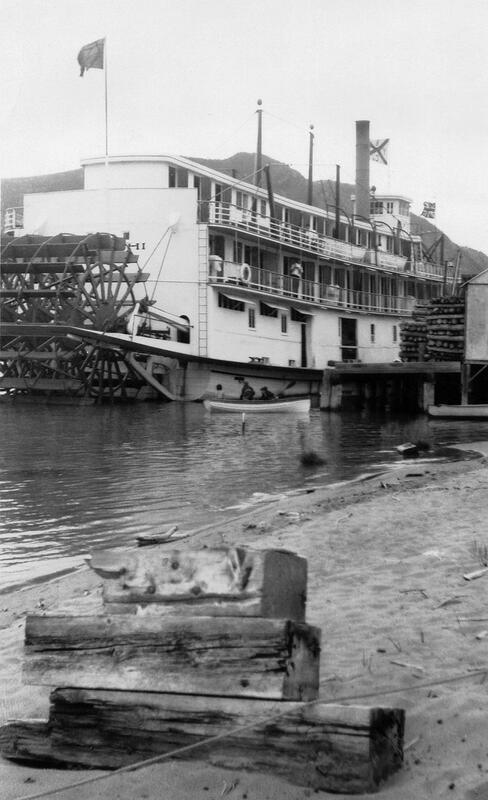 Built especially for the tourist business on the Southern Lakes (lakes right next to Carcross: Tagish Lake and Atlin Lake) she had a keel instead of a flat bottom like the riverboats on the Yukon River. mainly served as a pleasure boat for cruise ship passengers arriving at Skagway, AK, and being transferred to Carcross by railroad. But occasionally she also carried mail and freight. In 1925 the TUTSHI, originally build to be fired by wood, was converted so she could now burn oil as well. In 1955 her career ended and when she was hauled out of the water. 1972 the steamer was acquired by the Yukon government and restored.In 1990 a fire destroyed most of the TUTSHI. Today, the remains of this tragic fire are on display at Carcross, Y.T. right next to the Whitepass and Yukon Railroad station. The exhibit features most of the machinery, especially the two steam engines, boiler, metal parts of the paddlewheel and the front part of the hull. Barge No. 3 belonging to the A. & N. O. T. Company (Initials of the Alabama & New Orleans Transportation Company) founded circa the early 1920's. The photo could have been taken in a tributary of the Mississippi River in Louisiana or Alabama. 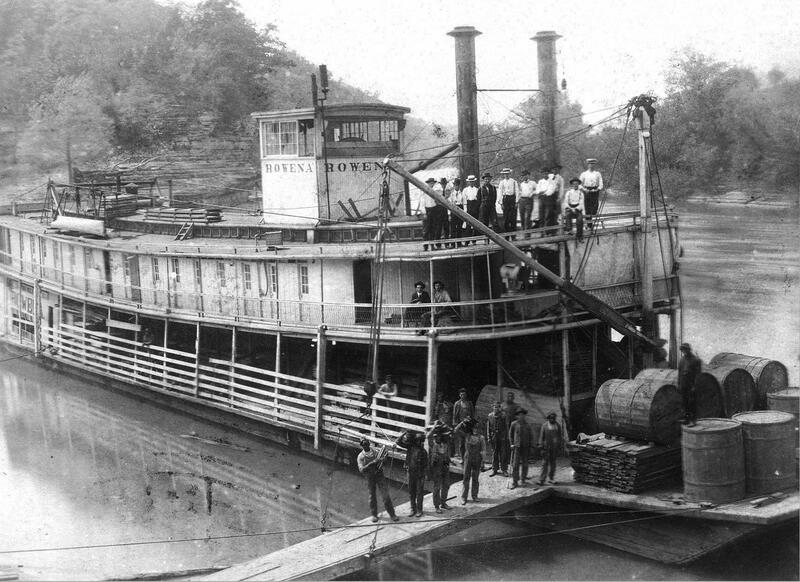 If more exact information turns up about the image such as where it was taken and the identity of the steamboat behind the barge the caption will be expanded. The small vessel in the lower right was probably a gas boat. The photo has a spectacular cinematic quality with the high angle vantage point, an interesting composition and all the activity in the foreground. This print is a new acquisition that just arrived 2 February 2017, and its dimensions are 4.40 x 6.30 inches. THE STEAMBOAT IS THE "JOHN QUILL" FOR SURE. I HAVE NO DOUBT ABOUT THAT. I THINK THE RIVER IS THE BLACK WARRIOR BUT COULD BE THE TOMBIGBEE. I THINK IT IS THE WARRIOR. THE TOMBIGBEE HAS LIMESTONE CLIFFS AND THIS ONE LOOKS LIKE A SANDY CLAY ONE. THERE WERE TWO OF THESE SELF PROPELLED BARGES THAT RAN ON THE WARRIOR CARRYING COAL AND IRON PRODUCTS TO MOBILE. THAT IS NOT A TOWBOAT BEHIND THE BARGE BUT A SUPERSTRUCTURE ON THE BACK END OF THE BARGE WHERE THE PILOT HOUSE, CREW QUARTERS AND ENGINE ROOM WERE LOCATED. I DON'T RECOGNIZE THE LITTLE GAS BOAT BUT SHE IS A NICE LOOKING ONE. I DO NOT KNOW IF THESE BARGES RAN THROUGH TO NEW ORLEANS. I AM SURE THEY COULD HAVE USING THE INTER-COASTAL WATERWAY. IT WAS CAPTAIN BUCK BENSON THAT TOLD ME THEIR WAS TWO OF THESE BARGES, DON'T BELIEVE HE EVER WORKED ON THEM. IF HE TOLD ME THE NAME OF THE COMPANY THAT OWNED THEM I DON'T REMEMBER. ALABAMA AND NEW ORLEANS TRANSPORTATION CO. MAKES PERFECT SENSE TO ME. THANKS FOR SENDING THIS VERY INTERESTING PHOTO TO ME. I HAVE NEVER SEEN IT BEFORE. Navigated the Mississippi; Tombigbee; Alabama; Mobile and rivers. 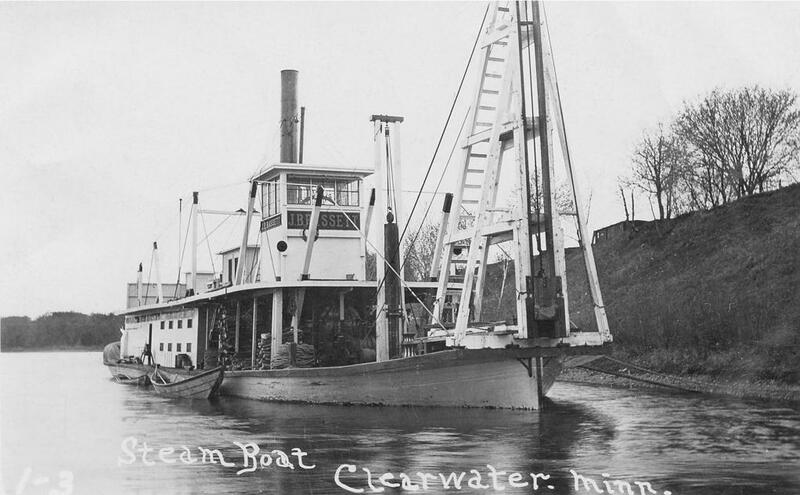 On June 12, 1916 she hit a rock in Warrior River and sank 15 feet. 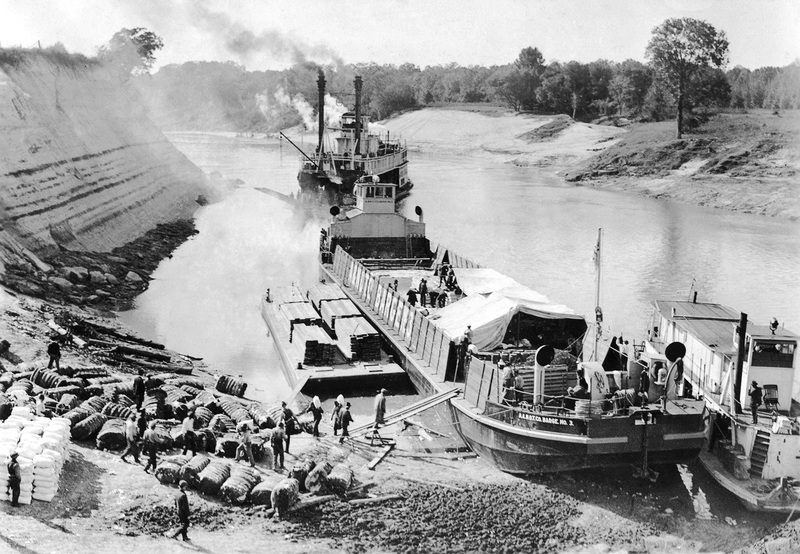 In February, 1928, on what was termed her last trip, a tug towed her from Mobile to Twelve Mile Island. One source indicated that she sank at that point. 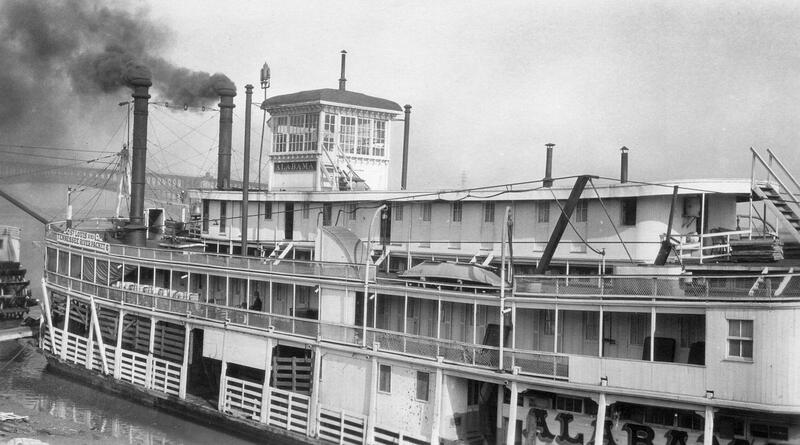 Sharp snapshot of the ALABAMA at the St. Louis levee with a "Texas" deck added which elevated the roof of the pilot house to a level only a short distance below the top of the stacks. Way's Directory - 0096; Ran the Paducah-Shiloh trade in 1929, the last regular steam packet on the Tennessee River. 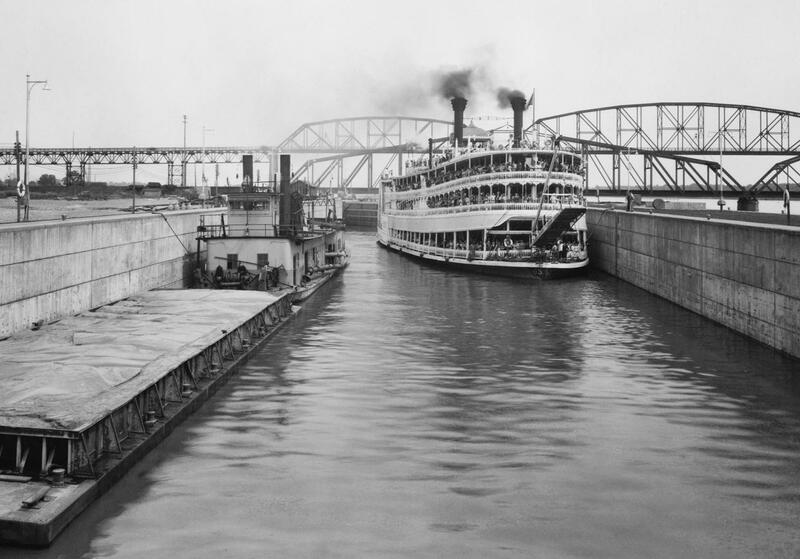 Was in the Cincinnati-Louisville trade under charter to the Louisville and Cincinnati Packet Company, in spring of 1931. Chartered to George Partin, Memphis, in 1932 for the Memphis-Caruthersville trade. Was retired soon after and made into a quarter boat. Ye ol' FALLS CITY passing under Kentucky's imaginatively named High Bridge on the Kentucky River. Brief background from Jessamine County tourism site: jessamineco.com "When the bridge was built in 1877 it was the highest railroad trestle in the world and the first cantilever bridge in North America and the highest bridge over a navigable stream until the early 20th century. 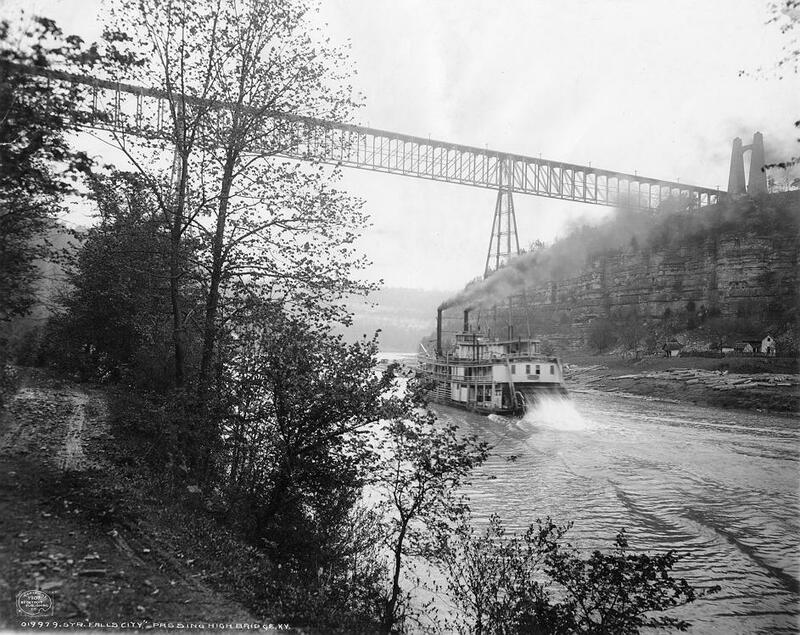 It towers about 280 feet over the Kentucky River Palisades." 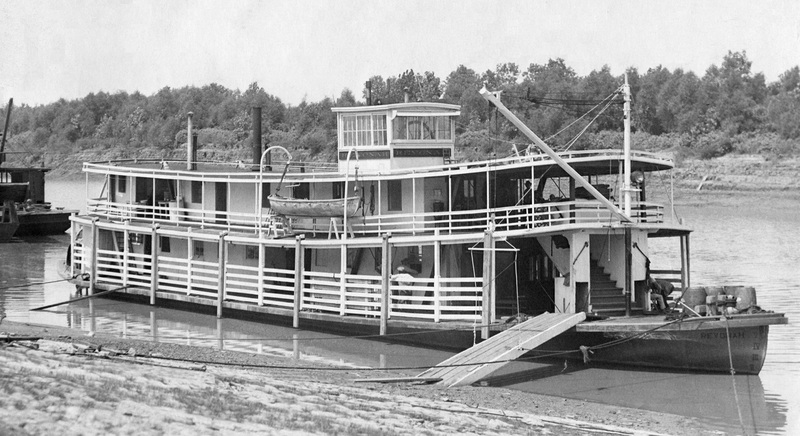 The sternwheeler FORT SUTTER: 1,139 tons, 219.2 feet, was built for the overnight passenger trade between San Francisco and Sacramento. The FORT SUTTER was built by Schultze, Robertson & Schultze Ship Builders at San Francisco and launched there in 1912. In 1927 the DELTA KING and DELTA QUEEN replaced the FORT SUTTER and CAPITAL CITY in the overnight passenger service trade between Sacramento and San Francisco. In 1942 the FORT SUTTER was drafted for troop transport in San Francisco Bay along with the DELTA KING & DELTA QUEEN; the ISLETON which was renamed the ARMY QUEEN, the PORT OF STOCKTON (formerly the CAPITAL CITY) and the CROCKETT (formerly the H.J. CORCORAN). For a while, the FORT SUTTER was a floating bistro on Threemile Slough, then later burned on the beach in San Francisco, on a date yet to be determined. You've got to love the old J.B. Bassett, she has a picturesque and unpretentious working boat quality to her that is ingratiating. Her owners name sounds like it should be adopted by a trendy new brewery: The Mississippi and Rum River Boom Co. The Mississippi River field guide web site has a capsule history of the company which is informative. The Mississippi and Rum River Boom Co.
At about Lyndale and 56th North was an operation area of the Mississippi & Rum River Boom Company. Northern Minnesota loggers cut trees and floated logs down the tributaries and the Mississippi to the sawmills at St. Anthony (Minneapolis). Of course logs of the different logging companies got all mixed together. Each log was stamped on its ends with the company's brand. The St. Anthony Boom Company and the Mississippi Boom Company were chartered to sort logs into the correct "booms" for the various companies. A boom is a string of chained logs that channel and corral floating logs. The companies received 40-50 cents per thousand logs sorted. 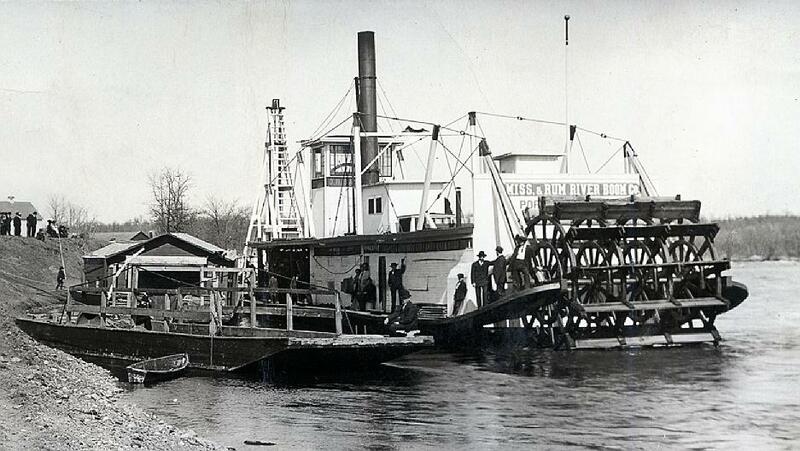 These two companies merged into the Mississippi and Rum River Boom Company in 1856. Their operations extended up the river to Monticello. Another photo of the J.B. Bassett. The rig on the front of the boat looks like it might be a pile driver to pound wharf pilings into the river bed etc. A favorite photo on the Library of Congress Digital Images collection. 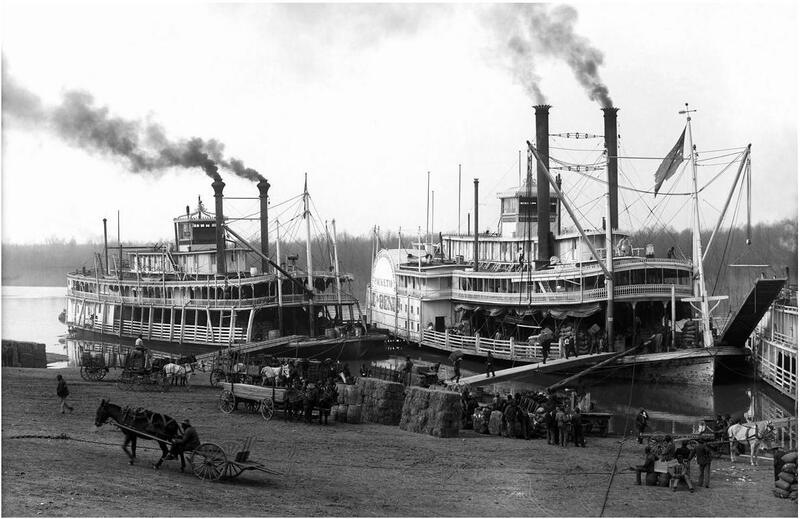 Sternwheeler Belle of Calhoun on the left and sidewheeler Belle of the Bends on the right. This looks like the landing at Memphis, Tennessee on the Mississippi.